That’s right. One of the benefits of a more resilient, more ergonomic flooring system is it will have some noise reduction qualities. This is true with most of our ESD flooring products. It’s not a huge reduction but a reduction nonetheless. For more information on the ergonomic benefits of StaticStop flooring products, please give us a call at 508-583-3200. Last month we announced our agreement with Repstronics, the Mexican distributor for a number of internationally known electronics manufacturers, including Panasonic. On March 1, we will be south of the border for the grand opening of Repstronics new showroom in Juarez, Mexico. In addition to our exhibit, Repstronics will be hosting other specialists and leaders in the manufacturing industry. For more information on Repstronics, click the button below. 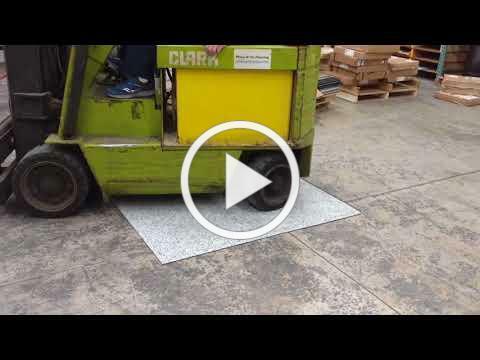 How do our tiles hold up to forklift traffic? In addition to good looks, comfort and versatility, our ESD tiles also provide durability. Check out this video to see for yourself.